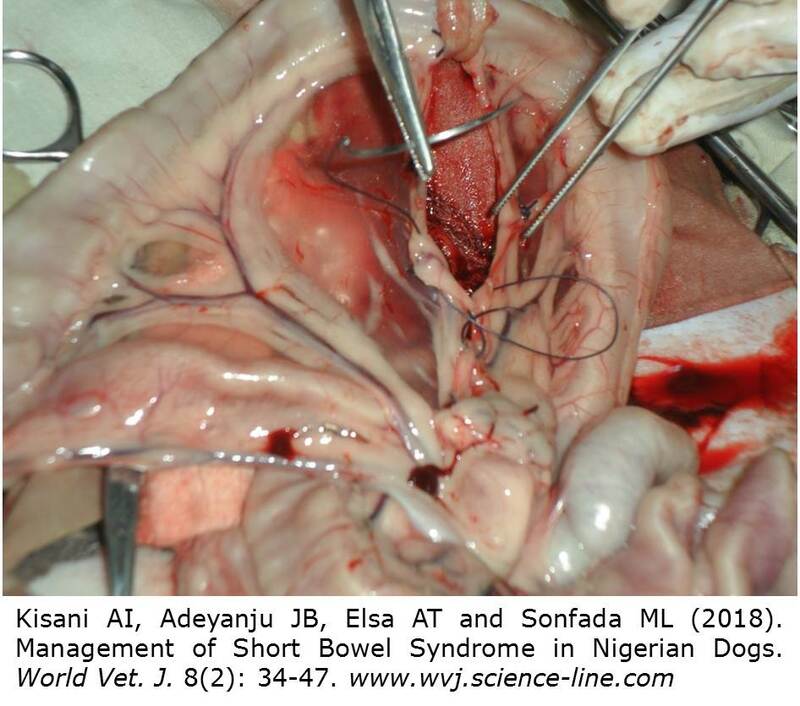 Management of Short Bowel Syndrome in Nigerian Dogs. Kisani AI, Adeyanju JB, Elsa AT and Sonfada ML. The effects of glutamine, honey, ascorbic acid and glutamine, honey, ascorbic acid combination on small bowel adaptation following 70% small intestinal resection in local Nigerian dogs were investigated. Thirty adult dogs with a median weight of 12.4kg (range 7-18 kg) were used in this study. The dogs were randomized into five groups of six dogs each following resection. Group 1 is the control group. The dogs here were not placed on any treatment. Group 2 dogs were placed on glutamine. Group 3 dogs were placed on honey. Group 4 dogs were placed on ascorbic acid and group 5 dogs were placed on glutamine, honey and ascorbic acid combination. Intestinal biopsy samples were collected at day 0, 4 weeks, 6 weeks and 8 weeks for histomorphometric study. Intestinal morphology was evaluated using light microscopy. The body weights of the dogs were monitored weekly for 4, 6 and 8 weeks in the five groups. Small intestinal adaptive response was evaluated at 4, 6 and 8 weeks post surgery. The animals treated with glutamine, honey, ascorbic acid and glutamine/ honey/ ascorbic acid combination experienced increase in intestinal villus height, villus width, crypt depth and wall thickness. The control group experienced a fall in intestinal villus height, villus width, crypt depth and wall thickness. The animals treated with glutamine, honey, ascorbic acid combination showed better therapeutic response followed by glutamine, honey and ascorbic acid in that order. There was a gradual increase in the body weight of animals in these groups. The control group did not show any appreciable adaptive response and the animals in this group progressively lost weight. It was concluded that dogs presented with short bowel syndrome could benefit from the supplementation of glutamine, honey and ascorbic acid in food.